I found this mural painted on a wall near the Hubbard Street Mural Project. I'm not sure if it is part of the project or not. 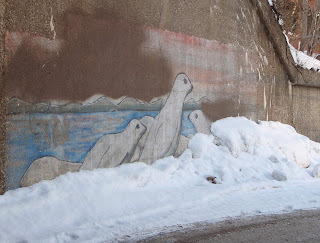 With the snow piled up against the wall, the artwork takes on a three-dimensional appearance. You've taken a great photograph. I've enjoyed browsing your recent posts, too.